We all make mistakes. It’s just a part of life to sometimes make questionable decisions. The most important thing to remember is that we all must learn from our mistakes. With these learning experiences come great knowledge. So perhaps it can be argued that the more mistakes you make, the better! Sometimes these bad tattoo decisions can be reversed with laser tattoo removal. My friend Sara may not necessarily agree with that, however. Not long ago, I blogged about Sara, because she needed to get a tattoo of her ex-boyfriend’s name removed from her shoulder. Although the procedure to get rid of her unwanted ink was a lot less painstaking than she had first thought, she still insists that getting the tattoo was a mistake she wish she hadn’t made. Today, I’d like to mention, however, that it isn’t necessary to hold a grudge against yourself for making a decision that you once thought would make you happy. Not all that is written in ink lasts forever. So, in other words, if you’ve gone ahead and gotten yourself a tattoo you wish you hadn’t, don’t beat yourself up over it. 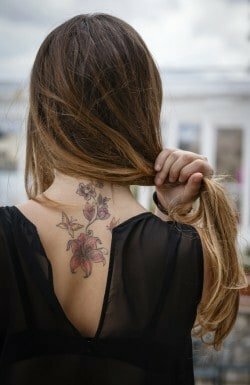 There are a few methods by which skin care clinics can help you with the removal of your tattoo. One of them is known as Q-Switch Laser. When I brought this up with Sara recently, she joked that the procedure likely got its name from being the remedy for those who wish to “switch” their minds from there “Questionable” decisions! 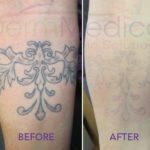 And although, this process may actually help to perform such a function, in actuality, a Q-Switch Laser refers to pulses of light energy that heat up ink underneath the skin. In fact, this laser is also used for the removal of birthmarks and brown spots as well. After the pigmentation or ink is heated up, it helps for the body to naturally break down the coloured cells. These cells are removed and replaced with new un-pigmented (or inked) skin. Like many other skin care procedures, the Q-Switch Laser process is a surprisingly quick one. Within five to ten minutes, a patient’s first appointment is complete. However, it is recommended that an anesthetic cream be applied to the treatment area at least two hours before the procedure. 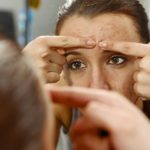 Once the procedure is done, patients may experience some discomfort or irritation over the next week while the skin heals. Generally, four to eight treatments are required for maximum results depending on the size of the problem area. For my friend Sara, her shoulder tattoo wasn’t very big, so it didn’t take much time for her problem to be removed forever!